Our website is client interactive. You can submit and edit your Market, Event or Business listings at any time by registering as a member of our website. If already registered, please click here to login, then click to add your Market, Event or Business listings from your dashboard. Any difficulties please contact us. Approximately 50 - 60 words allowed, deadline is 12 noon Thursday of the day it is due to be sent, currently sent out Thursday afternoon fortnightly. 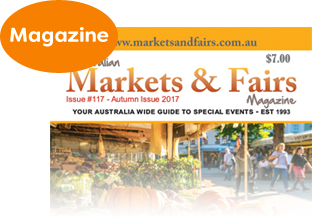 Newsletter entries are best suited to call outs to reach out to our large database of stallholders. Continuous coverage is best located on the website and apps via a Premium Listing or display advert. Display Advert at the bottom of the Stallholders Wanted E-Newsletter (SWN) $100 per E-Newsletter. Only 1 Display permitted per E-Newsletter and can be linked to your website. Electronic Direct Mailout (EDM) - $299 per EDM - EDM available that is devoted to your Business only (runs on the opposite fortnights to the SWN). ARTWORK: Available at approximately 10% of the cost of your advertisement. FREE Listings are also available on our website.